A call to Ken Burden at Fraser Yachts in Monaco brings news of a significant price cut on his joint listing with Jeff Partin, the 40.9m motor yacht Old Captain. Custom built in Riga, Latvia in 2009, Old Captain sleeps 12 guests in six staterooms and boasts several unusual features like a full sized swimming pool, casino and bandstand with synthesiser. Power is provided by a 1300hp MAK engine giving a range of 9,000 nautical miles at 11 knots. 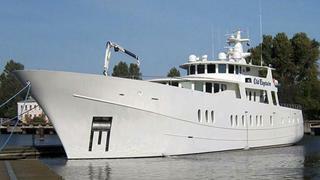 Currently lying in Imperia, Old Captain is now asking $6.9 million.